Victoria S. Bull flexes her muscles during her first appearance at a UB Football game against the Rutgers Scarlet Knights in Aug. 2001. Victoria debuted during the 2001-02 academic year, but fans have not seen Victoria in roughly eight years. A number of animals walk on two feet around UB every day: students, faculty, staff and geese. But one animal, a blue oxen, stands above them all as a fan favorite: Victor E. Bull. But the popular blue bigshot once had a sidekick, and Victor’s forgotten blonde sister is still missing more than ten years after she vanished. Victoria S. Bull, UB’s now-defunct female mascot, roamed the sidelines of UB football games from 2001 to 2007. Victoria entertained crowds, student orientations, pep rallies and more campus events for nearly a decade. But her unannounced disappearance in 2007 has left some fans puzzled, wondering what happened to the beloved female character. After a week-long investigation, The Spectrum discovered UB Athletics archives detailing the female bull’s origin in Western New York. After UB crowned Victor E. Bull as the official university mascot, “his kid sister Victoria” wanted to “be just like her older brother,” according to UB Athletics archives. Less than 10 years after her arrival to UB, she disappeared into a cloud of mystery. 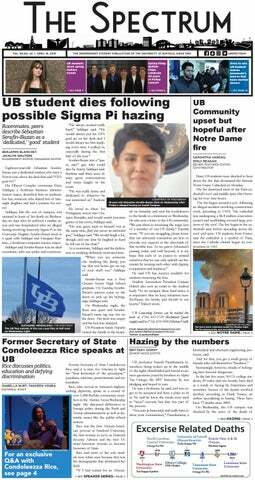 The Spectrum reached out to a number of UB faculty and staff, all of whom did not know about Victoria’s disappearance or did not respond to requests for comment. Fans have been curious about Victoria’s whereabouts since her disappearance. UB Naked Guy, who declined to tell us his identity despite revealing it to us this February, said he and “many others” in the student body “definitely have noticed” Victoria’s disappearance at games. He cites the cause of Victoria’s disappearance as a kangaroo mascot, which looks like a chocolate ice cream cone with eyes: Zippy. Ben Tunison, a senior graphic design major, is a member of True Blue and echoes UB Naked Guy’s theory. Jared Gavin, a ‘18 UB alum, was Victor E. Bull from 2015 to 2018. Gavin confirmed he never saw Victoria during his time as UB’s lovable blue mammal. “I would search and search for my lost sister, in every nook and cranny across the university, but she was nowhere to be found,” Gavin said. As more theories circulated, The Spectrum reached out to five different people named Victoria S. Bull around the United States, to get a clearer picture on the mascot’s disappearance. All Bulls declined to comment. During Gavin’s entire time as Victor, he said he felt like there was a “piece of the action that wasn’t there” because of Victoria’s absence. He said, in retrospect, Victoria’s presence would have changed the “whole dynamic” of UB Athletics games. Tunison said he’s unsure if UB has a big enough program to sustain a mascot on-top of the iconic Victor E. Bull. Given that bulls are scientifically classified as male cattle, and Victoria is a “female bull,” Tunison said UB should be correct when depicting a future female mascot. “Especially in a time like today, we’re all trying to be politically correct. With ‘Buffalo Bulls,’ the name works with the double B [wordplay,] but then if you have ‘Buffalo Cows’ you get the feminine side while you lose the nice wordplay,” Tunison said.